Because I love a list. Especially a random(ish) list. Three cheers for plenty of free parking. It seems strange to have huge grassy fields of nothingness for the other 51 weeks of the year, but it’s worth it for all the additional spaces. I hope they don’t ever pave it. Sorry about the azaleas, people. They were gorgeous a week ago. At least the pollen is better than it usually is, and the grass is absolute perfection. What’s up with the rock star looking golfers? Spiky long hair and hats on backwards? I’m not saying we need to go back to plus-fours, argyle socks, and tam o’shanters (wouldn’t that be cool though?) but yuck. Despite my suggestions, there were plenty of you fools out there in jeans. First of all, it was 90 degrees on Monday. That isn’t jean weather. Secondly, you’re going to one of the most exclusive events in all of sports, the trip of a lifetime, and the best things you can dig out of your suitcase are your circa 1980s faded jeans and a fraternity t-shirt? Also, you, lady with the teensy black tank top. Although I’m sure the men appreciated the view of your, ahem, upper region, the shorts were pushing it. I shouldn’t be able to tell that your upper thighs have more dimples than a Titleist Pro V1. I shouldn’t be able to see your upper thighs period. Like, as a general rule. I figured out why some people wear golf shoes out there (besides the players of course). Supposedly, they’re a lot easier to clean than expensive running shoes. The spikes add traction after a big rain. It’s apparently acceptable to own and wear golf shoes even if you don’t play. Don’t tell, but I’m thinking about trying some on. I’m glad to see they fixed the sign with the grammar mistake. “Quite please” sounds so dainty and all, but it doesn’t make sense. What it did do was show that they aren’t perfect. Pretty close, though. As if it was possible, the egg salad out there is somehow better this year. On Monday alone, I ate three and brought two more home. I’m curious as to why they took away the chicken filet sandwich and replaced it with a grilled chicken wrap. There’s nothing wrong with healthy options, but why can’t there be room for both? Beer sales used to stop at 4. Some genius (my hero) decided to extend sales until 5pm. No more grabbing as many beers as you can carry at 3:59. Now we do it at 4:59. There’s nothing better than getting to send someone out there for the first time. Even people who haven’t ever watched a second of golf can’t help but be mesmerized by the vast, crisp fairways and luxurious green grass. When I went for the first time in 1997, I got it right away. Cheap beer didn’t hurt the cause. I haven’t missed one since, and I feel kinda spoiled by it all. Remember when The Partridge Inn was the place to be Masters week? The porches would be overflowing and parking was at a premium. Then they decided to charge a cover and jack up their prices for canned beers. If you haven’t done it already, go download the Masters app. They have it for both main kinds of smart phones. It’s free, and it’s the prettiest and most useful app out there. You get bonus coverage each day. Go to the player bios and then turn your phone sideways. It becomes the player’s scorecard. Magical! 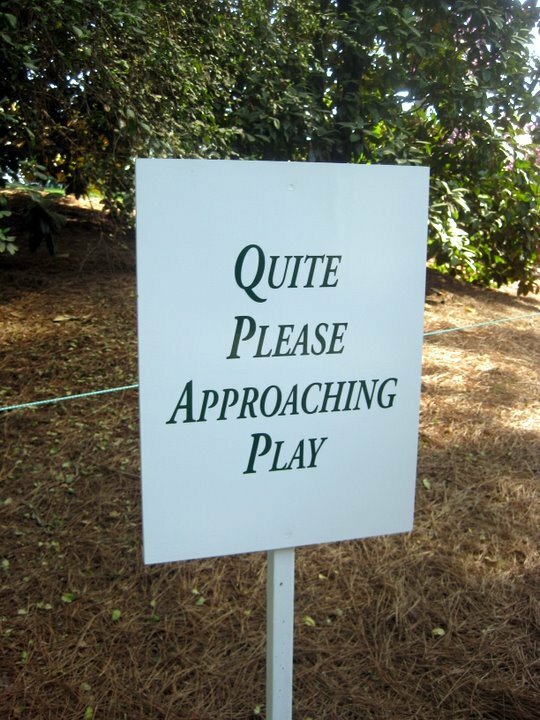 This is one of those tricky years when Easter and Masters Sunday are the very same day. We have plans to eat deviled eggs and ham biscuits, sipping mimosas and spending time with family. We’ll be outside, enjoying the perfect Augusta spring weather. We’ll all be on the deck, gathered around the TV, watching coverage of what is arguably one of the best days in all of sports. Happy Easter and Passover, joyous Masters, and cheers, y’all! on their not inviting a woman to be a member.